Many of you no doubt know commenter Sarah Portland, a longstanding, intelligent, periodically evil presence on this blog. Well, she runs her own episodic review site, focusing on Star Trek, the original series. Just recently, however, she finished that classic show, and moved on to its…marginally less-classic Animated Series spinoff. So, yes, utterly shameless plug, because her Star Trek reviews were great and I expect these will be too. Check them out. 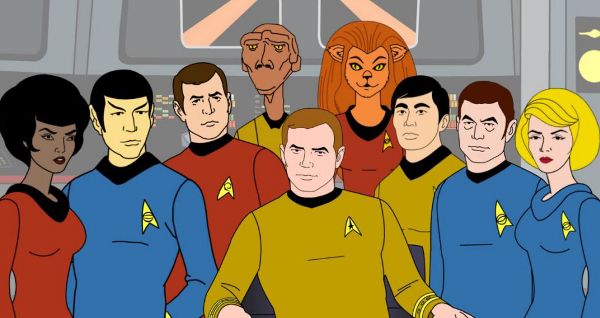 Today saw her first post about the cartoon adventures of the Enterprise crew, which according to the picture above consists of Uhura, a butter sculpture of Mr. Spock, Chevy Chase circa 1982, Jar Jar Binks, Zapp Brannigan, the painting lion from Zoobilee Zoo, Bruce Lee, Tommy Wiseau, and Anne Heche. So, go read that while I try to muster up the energy to write about Fallout 3.